Well, Autumn is here again, and any hope on an Indian Summer has (mostly) evaporated. Although you can never be sure, remember the first weekend of November a few years ago? Almost "tropical" it was. But, better safe than sorry. If you are the proud owner of wooden garden furniture it is high time to take a proper look at it before you store it away for next year. Is it dirty or stained? Has it become dull and listless? All of the above can be solved with Saicos Furniture Care Set. With the SAICOS WOOD BRIGHTENER and DEGRAYER is an easy to use, highly effective special liquid detergent to clean and refreshen greyed, unattractive looking exterior wood surfaces without sanding. The original colour of the wood will appear again. The set also contains a brush, application cloths and a cleaning pad. Like your wooden floor, your wooden garden furniture will stay beautiful and healthy a much longer time when you regularly care for it. Below you'll find some of the (very) short questions we also receive through our ?Help desk. Have a question yourself (long or short, doesn't matter) use the ?Help button on the right-hand corner at the bottom of every page. First time you use this service? Keep an eye out for the confirmation email and click the link, otherwise we'll never see your question. So, here we go: small talk. Buffingblock: Is this item no longer available in the UK? Thank you. I'm interested in the coloured waxes for untreated furniture. Can you recommend a filler that i can purchase from a shop such as homebase, b&q, wickes or screwfix? Why? Is the product we sell not good enough for you? Main difference: polish can only be used on oiled/waxed floors, spray can be used on any finish. Help! My husband spilled some varnish (the sort of hard clear stuff used for craft projects) onto the parquet floor. How can I get it off? I'm going to belt sand our "5 fingered parquet" kitchen floor. It is not a big floor space but it's looking a bit patchy and faded in parts. Can you advise the best grit belts to use? You could start with grit 60, if that doesn't get rid of all the finish, use grit 40.
going to renovate 60`s parquet flooring, should i fill the gaps with the saw dust and resin or will this crack and look worse? My floor was laid a few months ago now I have gaps. It is an 18mm solid oak wood that was floated on a fibreboard underlay by glueing the tongue and grove what can I to rectify this issue. Installed before Winter? Wait until Spring really gets going, the central heating is turned down and the humidity increases. Spring is here! Sunny days, rainy days, windy days - no matter what the weather, Spring is definitely arrived. So on wet and windy days, what better ways to wait for the sunny days is to maintain your wooden floor - and protect it against moist footprints - among other things. 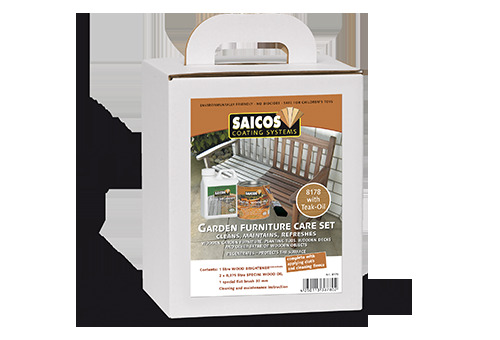 And on sunny days, treat your wooden garden furniture to life prolonging maintenance with - again - Saicos garden furniture care products or spruce up your wooden decking or outside stone, bricks, tiles, concrete, ceramic, plastic, varnish (by removing the green growth) with Green-Ex - also ecofriendly. No matter what the weather brings you, Wood You Like maintenance and exterior wood care categories are there for you. Well, Winter time is here again, and any hope on an Indian Summer has (mostly) evaporated. Although you can never be sure, remember the first weekend of November last year? Almost "tropical" it was. Weekly we receive various questions (have a question yourself, use the ?HELP button at the bottom of every page), this week two of them were kind of hypothetical questions. I've just sanded my parquet floor and it looks really nice, I love the pale colour it has now. What will happen if I leave it just like this and won't treat it with any finish? Well, for one thing, this pale colour will eventually fade. Every sanded/bare wood will mature over time, some tropical species it is a matter of weeks, Oak will take around 1.5 - 2 years to get its characteristic honey colour. For another thing, long before the wood has matured it will be very dirty and stained. You'll walk in city and/or country dust from outside which will cover your floor - especially those areas which will receive the most "traffic". Dusting or vacuum cleaning daily could help, but will not prevent stains. Human beings are prone to stain: coffee, tea, soup, pasta-sauce, beer, red wine - nothing can prevent us from spilling some of it. Plus, don't forget muddy paws from your pets! And because your floor is not protected, any spillage will stain your floor. So, not treating your floor at all will only give you this pale and wonderful stainless surface for a very short time I'm afraid. However, there are some products around that'll help you keep a paler look for the longest time (but eventually the maturing of the wood will win). Solution one: Saicos Premium HardWaxOil contains fewer linseed oil than other brands, enlarging the time to mature. Solution two: one of the sheens available with Saicos Premium HardWaxOil is the Pure sheen. This sheen is created especially to enlarge the time until maturing even further, plus gives your floor an even paler shade than the other 4 sheens of Saicos HardWaxOil. Solution three - which gives you the best (longest) result but takes a bit more work: Aunt Poly's Polishing Wax Ivory White, which will give your floor a transparent finish and will, just like Saicos HardWaxOil, enlarge the time to maturing. To fully protect your wood floor against dirt, drips and spillages it will take a few coats of the Ivory White polishing wax so instead of within one day with Saicos HardWaxOil, it might take over two days to finish your floor. As long as you sand the floor again - with grit 120, not higher because that'll close up the grain - to remove all the excess filler, you can safely use the Saicos Tropical Combo. Have a question yourself? Use the ?HELP button at the bottom of every page and we will do our best to answer as soon and as best as we can. If this is would be the first time you use this button, keep an eye out for the email confirmation email and click on the provided link - otherwise your question will not reach our inbox! Still wondering what to get your family or friends this Christmas? How about a Wood You Like Gift Voucher? or a Winter Floor Care Set? 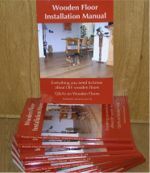 Thought abour the Wooden Floor Installation Manual? Perhaps the Utlimate Maintenance Guide would be the perfect gift? or any of our superb maintenance of finishing products? Wood is a beautiful and versatile product, used in a large variety of products for both in as outside your home. From furniture, natural wooden flooring, internal and external beams and supports to wall/roof cladding and decking. It breaths, shows its natural character and is one of the rare products that - if treated correctly - becomes even more beautiful with time. SAICOS UV PROTECTIVE WOOD FINISH EXTERIOR is based on natural vegetable oils. The natural raw materials penetrate into the wood, keeping it sound and elastic and avoid wood becoming dry. Allows the wood to breathe therefore the moisture can evaporate and shrinking and swelling will be reduced. Can be applied on all exterior wood which is to be left “natural“, ie: wood panelling, undersides of roofs,Wooden gardenrn furniture, summer houses, outside windows and doors , fencing etc. Drying time: Approx. 6 - 8 hrs. (depending on air temperature and humidity). Dust dry after approx. 4 hrs. Second coat can be applied after complete drying. Now available in our secure webshop! The Easter Bunny seems to have visited Wood You Like's online shop and has hidden some of his Easter Eggs! Find the Eggs and receive a very special Easter Surprise 10% discount on that particular product! All you have to do is search for the Easter Egg on the product image (hint: the egg looks like the picture here on the right) and use the special coupon code you'll find in the description of the product during checkout. New Spring = New Look - at least for Saicos high quality products for floor finishes, floor maintenance - for your interior and exterior wood.